Anti-ageing Apple A Day keeps tired skin away and promotes a bright, healthy complexion. Green apple combined with other tasty active natural ingredients such as almonds and apricots, work to visibly revitalise your skin while the broad spectrum SPF protects you from UV damage and pollution. 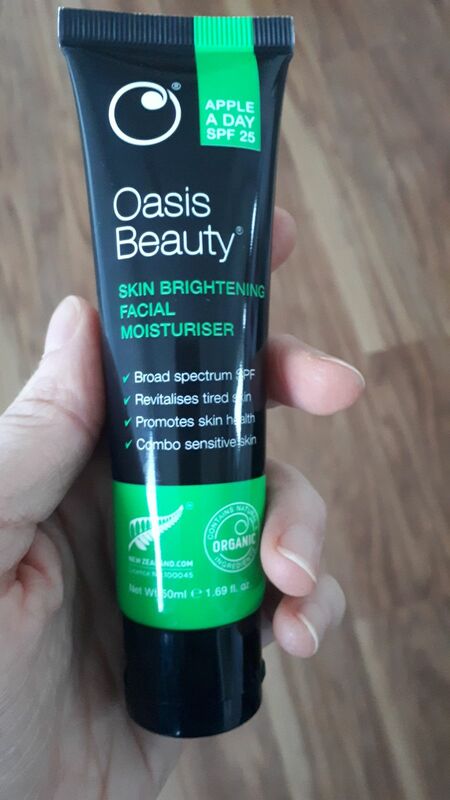 With a light, apple aroma, this non-greasy moisturiser will keep your skin looking bright and hydrated all day long whilst also offering all-year round protection from the sun’s damaging rays. As you know, we take sun protection very seriously at Oasis because the New Zealand and Australia sunlight is the harshest in the world. So you can have absolute confidence that Apple A Day is designed to keep your skin protected in the harsh Southern Hemisphere sun, helping you to avoid premature ageing and skin cancer. It's the best anti-ageing product you can invest in. Tested in 2016 in Australia against International Standard ISO 24444 and rated PA +++ (full 10-subject study). This is a measurement of protection against UVA rays. This product is now undergoing re-testing as per our 2-yearly testing policy. Tested in 2018 in Australia at SPF 33.1 against International Standard ISO 24444 and AS/NZ Standard 2604:2012 (full 10-subject study). This is a measurement of protection against UVB rays. Apply Apple A Day after cleansing and toning as part of your daily skincare regime. A little of this goes a long way, so we recommend you squeeze a small amount onto the back of your hand. Using your fingertips gently dot evenly around the face and neck and then join the dots up, massaging into your skin as you go. Use a gentle touch to avoid dragging, or pulling, the skin. Then allow time for the moisturiser to settle and set up the sunscreen barrier, before applying your makeup or Oasis BB Cream. For an extra skin boost and extra sun and pollution protection, apply Solar Serum® with Lycocelle® underneath. Why use an Oasis SPF Daily Moisturiser? Even in winter and on cloudy days the sun’s rays harm your skin and age it prematurely. Using a daily moisturiser with sun protection built-in means it's easy to protect your skin every day from these damaging effects. At Oasis we take sun protection very seriously. We have to. We live in a place with the harshest sunlight in the world. So, we send all our sun protection products for testing against NZ/AS 2604:2012 standard. This product was also tested for a PA+++ rating. This refers to the amount of protection specifically against DNA damaging UVA rays. Need more reasons to use an An Apple A Day Skin Brightening Facial Moisturiser? If you have tired-looking skin with uneven skin tone, this product is for you! It promotes skin health by both protecting with SPF and nurturing with active natural ingredients. If you are concerned about premature ageing, by protecting your skin from UVA and UVB rays on a daily basis, your skin will actually get a chance to repair the damage you've already done. In short, combined with a good skin care routine, it will get your skin looking its best and keep it that way. In the past I've found that natural products with more oils in them sit heavily on my skin and give me breakouts. But this moisturiser is light, absorbs quickly and no breakouts! A little goes a long way too. Love the feel and smell of this product. It is really does brighten my skin. I absolutely love this product. Nothing to moan about here.